Hot and new: string lighting. Outdoor lighting has many functions--from landscape lighting to security lighting to ambiance lighting. Your objectives are important whether you are updating your current lighting system or installing a new one. Let’s start with the porch light. For many homes, the porch light and possibly a spotlight over the driveway are the only outdoor lights they have. While this seems adequate, there are so many other options available which are more adequate. Layered lighting in the outdoors provides a huge security bonus. Outdoor lighting ramps up the curb appeal of your home. Curb appeal will sell your home if it’s on the market and increase the value of your home if it isn’t. Whether you decide to show off some of your home’s better features or your landscaping, outdoor lighting, properly planned, can provide this. Some of the options include silhouetted trees, strategic low-level lighting for driveways and patios, and pathway lighting. As another example, string lighting is one of the newer forms of outdoor lighting enjoyed by residents as well as businesses. In fact, the city of Peoria, Arizona, just added string lights to their P83 Corridor as part of their streetscaping. String lights make a beautiful, romantic addition to a patio, deck, or barbeque area, as well. LED lighting can be soothing and whimsical. Another lighting option is LED lighting, especially LED lighting strips. 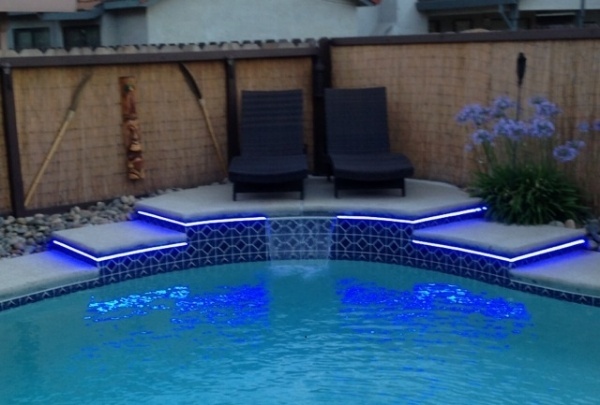 LED strip lighting comes in a variety of colors, brightnesses, and styles. You can purchase DC and AC flex strips, nonflex strips, and even high-powered rope strips. LED lighting is sustainable lighting at its best. Security lights can (and should) be motion sensored. If that isn’t an option, they can be on a photocell (dusk to dawn), or solar-powered. Motion sensor lights are roundly hated by criminals since they might also have a camera and alarm activation. Outdoor lighting can be battery powered, hard wired, low voltage, line voltage, solar, or plug-in. These come in a wide range of beautiful finishes and styles which will enhance any outdoor home design or landscaping need. Outdoor lights can be integrated to work with a Smart Home, and in tandem with cameras and alarm, so the homeowner is alert to who is on the property at all times.